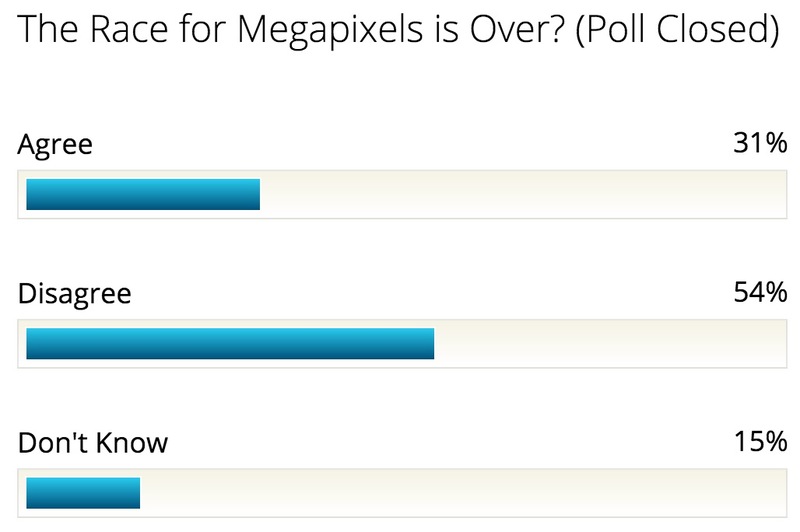 Axis Declares Megapixel Race Over! It's Over! The race for more megapixels and higher resolution is no more, according to IP camera gorilla Axis - whose top resolution for most cameras is 720p/1.3MP and who has no cameras supporting more than 5MP. Is this true? Has the race really ended? Should someone inform Axis' rivals making 8MP, 10MP, 16MP, 20MP, 29MP and higher resolution (e.g., gigapixel) cameras? In this note, we dig into the claim, Axis's rationale and how the race for camera supremacy will evolve. "The current limitations of professional-grade lenses"
"Image quality has reached a point where few users require more resolution than what’s available today"
"The race for business and operational intelligence begins. With the ability to download and run applications directly at the edge, the IP camera is now the iPhone of the surveillance world"
Needless to say, Axis has visions of sugarplums dancing in their heads. IP cameras today, even Axis's, are far from being anything like an iPhone. However, this does highlight a key Axis development priority over the next few years. Inside, we dig into these key trends. The shift to megapixel over the last 5 years has significantly increased the number of users who can cover the areas they need. With SD, the problem, any time you needed to cover an area of more 10 or 15 feet, you either had to use multiple cameras or give up critical details of faces, license plates, etc. Most users, in the past, just accepted capturing low details rather than saturate areas will arrays of cameras. Even going from SD to 720p made a big difference as the coverage area width could routinely be doubled. Additionally, long areas, like hallways and aisles can make use of greater resolution. A common theme for all of these areas is that people tend to congregate in them, making them especially important to have surveillance. This easily represents a third of all locations needing surveillance, making it a substantial market. Despite this and the ongoing megapixel 'race', very few offerings exist above 3MP. Most IP camera manufacturers max out at 3MP including big brands like Panasonic, Pelco and Sony (with Bosch offering only a single 5MP camera). Even Axis only has a few cameras above 3MP. As such, the market is nowhere near saturated for higher resolution cameras. Improved low light performance and enhanced WDR are two key areas where higher resolution cameras will see improvement over the next few years. While there may be many 1080p cameras out there, very few have strong low light and WDR performance. This situation is even worse for 5MP and higher cameras. Whatever manufacturers can stake a lead in these areas will have a material advantage in the market. CPUs overcame limitations in increasing pure speed by adding more cores. Similarly, megapixel cameras can overcome limits on lenses, low light and WDR performance by using multiple imagers. We think this is one of the most critical battles in the 'megapixel' war. Multi imager megapixel is dominated by Arecont Vision with few rivals and Axis not even in the mix. Putting multiple imagers in a single camera housing, allows for much higher total resolution (e.g., 4 imagers at 2MP each delivers 8MP in a single 'box') while avoiding common problems. Moreover, the economics of this approach are extremely compelling compared to putting multiple megapixel cameras side by side. For wide area monitoring (e.g., 180 or 360 degrees), this is a very powerful solution. While Arecont has been offering it for years, and doing great business with it, competitive options remain limited to proprietary offerings (e.g., Avigilon's JPEG2000 version) and niche options (e.g., Scallop, Dallmeier). Despite this, Arecont aggressively continues to improve with a promising upcoming 12MP WDR version. Perhaps, patent issues constrain this segment with Arecont holding a patent on multi-imager cameras as well as being sued by an earlier patent holder on the technology. Fundamentally, multi imager megapixel offers significant value and will nearly certainly be a key element in competitive future battles. The most basic race for more megapixels will be simply using higher resolution sensors. There is no shortage of imagers from the consumer side at 10MP, 14MP and even higher. As they have been brought over for years, we expect this to continue to be done. This is not an unmitigated good as the fallacious advertising around super megapixel cameras can harm users (i.e., the 'up to' 95 camera replacement claims). However, it is sales gold. People love big numbers and having the highest resolution camera is like having a super high horse power engine. Even if it is a waste or not of any real practical benefit, it opens doors and it signals to customers that a manufacturer is a leader. Even if these super high resolution cameras do not sell that much, the drive to be the perceived market leader in 'more megapixels' will remain a key factor of this race. However, megapixel is not the only race for camera vendors. Perhaps the biggest race will be which camera manufacturer can best move VMS software onto their devices. With camera computing power increasing, it is becoming easy for IP cameras to manage their own recordings and not depend on a centralized VMS (e.g., Milestone, Genetec, Exacq, etc.). Eliminating the $100 to $200 that users typically spend on licenses and server hardware is a very attractive proposition. Those camera manufacturers who can most effectively do that stand to gain a significant edge for buyers of smaller to mid sized systems. Indeed, we see this as one of, if not the top trend in all of surveillance. Currently, the 3 camera manufacturers that are farthest along in eliminating VMS server software are Axis, Bosch and Mobotix. With its super high camera prices, Mobotix is likely to remain a niche player. By contrast, both Axis and Bosch have invested in lower price lines which complement eliminating VMS server software. However, it remains to be seen how much they are willing to offend their VMS partners, a proposition that both are at least somewhat hesitant to do. As such, the field is certainly open for other camera manufacturers to take the lead in this race. This last race is the one that Axis centers on in its projections and that it has the strongest competitive foundation. Three years ago, Axis launched their Camera Application Platform (ACAP) that allows applications to be loaded on their cameras (like the iPhone). Even today, no other major IP camera manufacturers has anything close. However, even for Axis, it is still going to take some time. Processing limitations for more advanced analytics are still an issue even with their latest ARTPEC-4 platform. Plus, the number of applications on their ACAP platform are still very limited. However, over the next 5 years, this can be overcome. Video analytics remains the 'next big thing' and, once it finally comes to fruition, Axis is very well positioned to be the leader in that race. Until then, it is more potential than payoff.